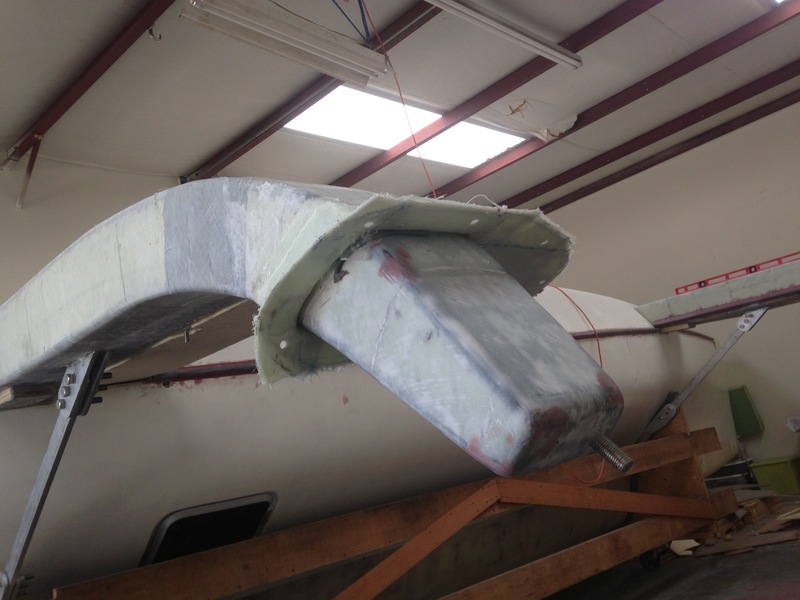 Made good use today of a five foot section of carbon fiber mast from a previous salvage. 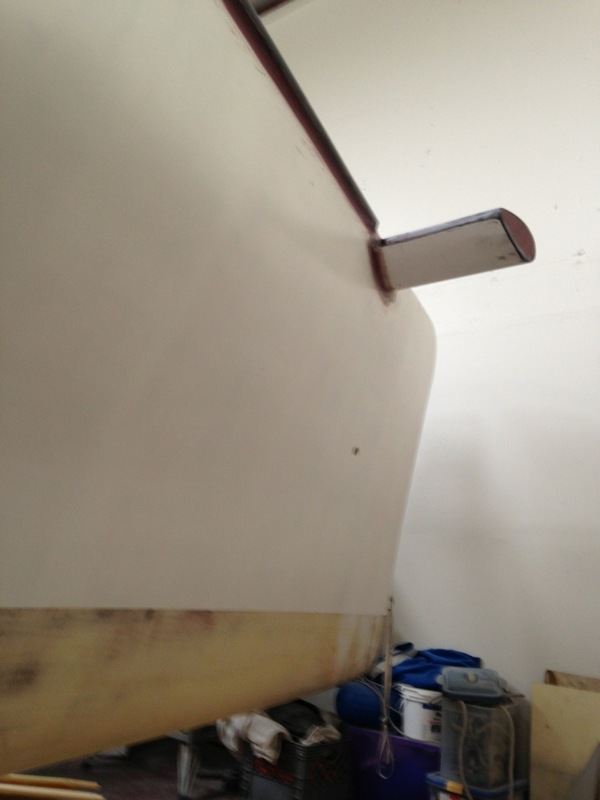 We used a thin slice to mark the hull, then cut in from both sides just inside the front of the anchor locker. 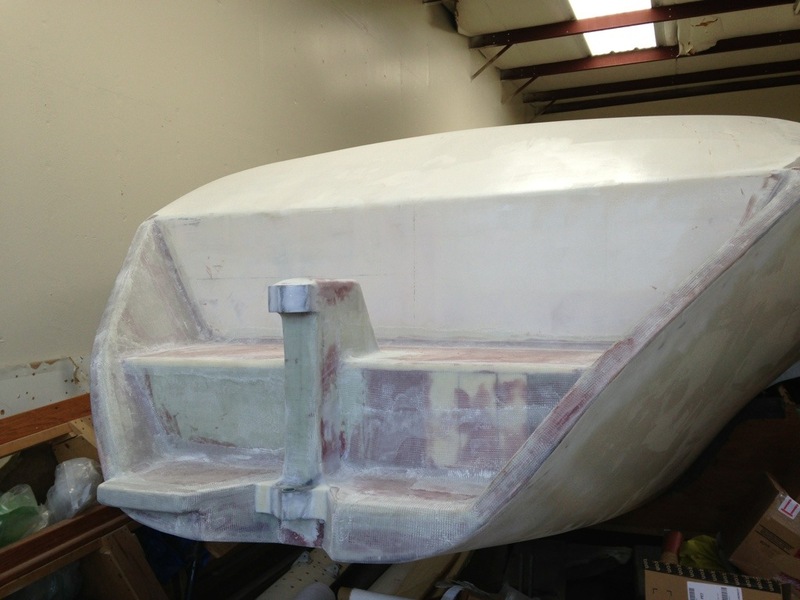 The mast section is very strong and will make a nice foundation for anchor rollers on both sides of the bow. 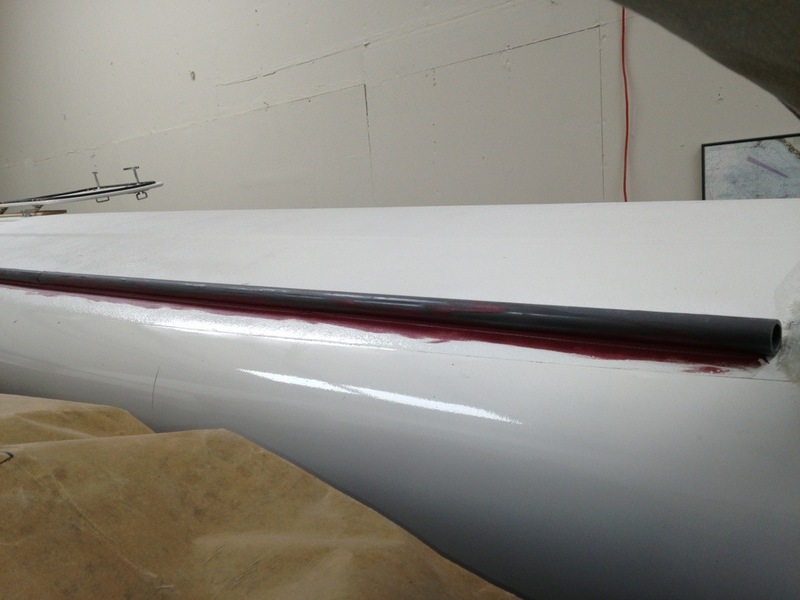 It certainly changes the current sleek look of the front of the boat, but keeping the anchor(s) away from the bow stem and fore-sail handling will be a great help. This will also be the attach points for the nets, making the whole front end safer as the nets get wider. 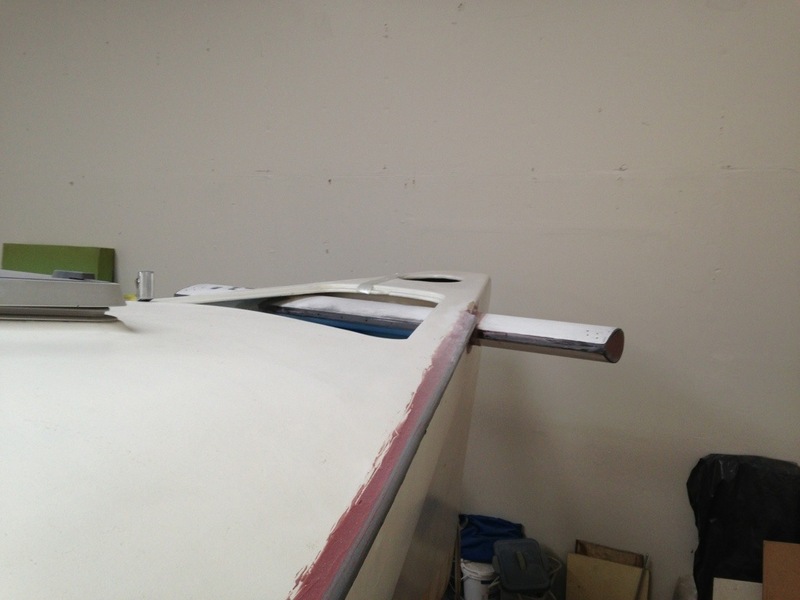 We reached a nice milestone today with the last step of fitting the beam and float main hull all together. I thought that the float would lower immediately under its own weight once unbolted and the jack inched down. But it actually took quite a bit of levering and wiggling to get everything apart. The beams with their fairings are getting quite heavy – almost too much for Griffin and I to bring down. Will probably rig a tackle from the roof trusses for the port side. Here’s the completed beam-to-float bolting flange. 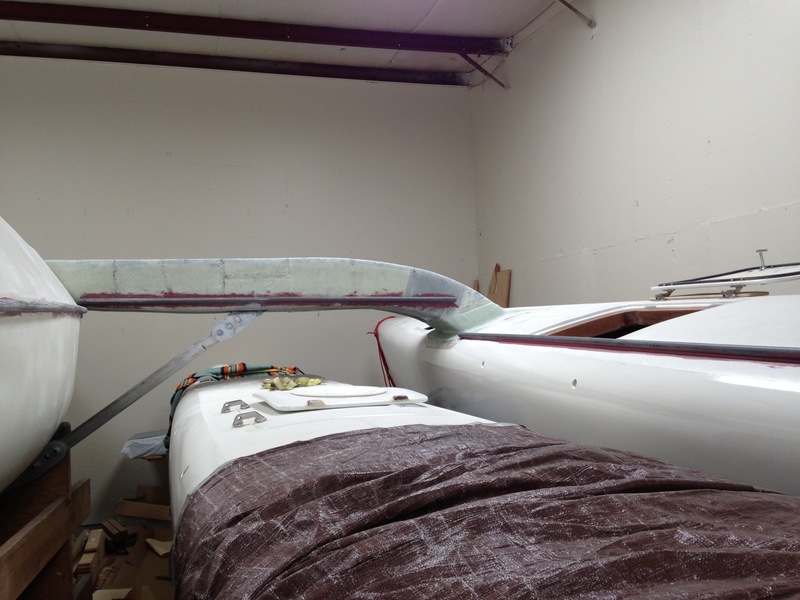 The jagged edges will be cleaned up in the process of final glassing and fairing of the completed beams. Light at the end of the tunnel!! 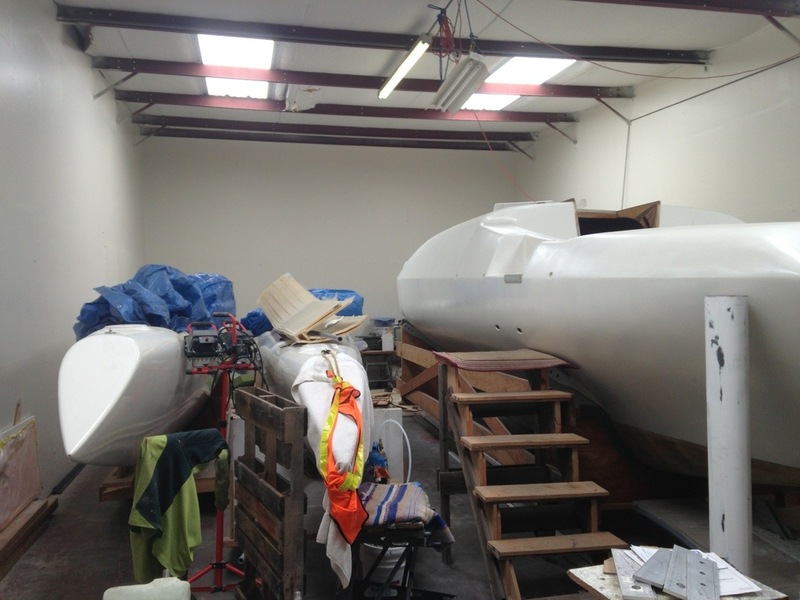 Well, no posts in April because it was only a day or two in the boat shop due to extensive work travel. And a fun Saturday at the Strictly Sail boat show in Oakland. Drew, Dad and I hit the info booths hard; navigation equipment is tricky as we search powerful auto-tillers and wind instruments with the rotating mast. But good progress was made on the engine-to-prop system, leaning towards Yanmar and a Gori prop now. 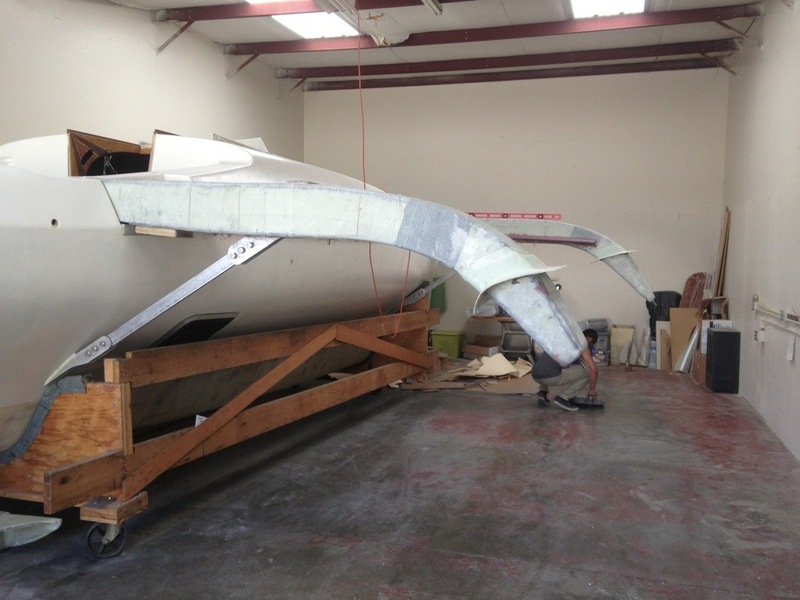 Here’s the rear deck with rudder post area now complete, ready to start fairing. Stopped in at Home Depot for 10′ lengths of 3/4″ PVC electrical conduit to form the basis of the nets’ lashing anchor points. Epoxied them to the hulls and beams (used temp screws to hold in place), then a few hours today to fillet them for more bonding surface area. Next they’ll get glassed over with two layers of cloth. Once these tubes are all built and faired in, we’ll use a jig to cut ‘windows’ in the tubes so small rope can be looped over a small rod inserted the length of the conduit pipe. And finally with a weeknight not on the road, I sat in the little engine room for an hour last night finally figuring out locations for the water tanks, fuel tank, fridge compressor, watermaker and furnace. A bit if a puzzle, but things should tuck nicely in to their spots. First up was finalizing the refridge order with the CoolBlue people in Orange County today. Good USA quality, at a decent boat-show discount. Let the systems begin!